This book came from a series of blog posts. The subject was Writing A First Novel. I used my own first published work of fiction, The Legend of Bagger Vance, as the example. Then one day I thought, Why not expand these posts into a short book that could get into real depth on this subject? Will Smith and Matt Damon in the movie version of The Legend of Bagger Vance. How did I structure the book? How did the characters originate? What was the book’s theme? Did I follow any specific formula or sequence of genre conventions? What was the easiest part? The hardest? How did I sell the book? How did I make a deal with the movies? What lessons did I learn that might help other first-time writers? 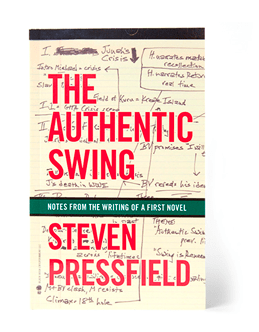 The front cover of The Authentic Swing was made from the original sheet of yellow foolscap that I used outline The Legend of Bagger Vance. Available in paperback, audio and e-book from the Black Irish Books store.